Download this Power Point from the left sidebar. Thisis the question bouncing around the industry: "Is green a niche, a fad, or a fundamental shift in consumer behavior?" The jury may be out on the answer, but each contractor needs to master the technical skills to produce better buildings or suffer a business death of irrelevance. The knowledge exists to do so, and I know of no consumers who say "I want a worse performing building." Selling these performance characteristics (tighter homes, less energy consumed, more comfort, more durability) is often an up-sell with consumers fixated on first-cost as their criteria. The incentives of personal satisfaction, pride, and social responsibility cannot be imposed on others who may only ask "how much?". Every home owner will have slightly different motivation. Exploring their motivation, and helping with their decisions, will lead to more improved buildings. A search of local contractors generated a gem of a find in Milo Services . Milo is reputable, hard working, and eager to accumulate knowledge in the home performance arena. One of the tasks of this demonstration project is an educational component attempting to enlighten contractors about the enhancement of homes. Milo has a great attitude towards learning and brings experience and creativity to the table. The content of Affordable Comfort combined with the delivery of the Building Performance Institute offers a solid path to raising the bar in home performance. Milo and his dad, Clyde, working the job site. 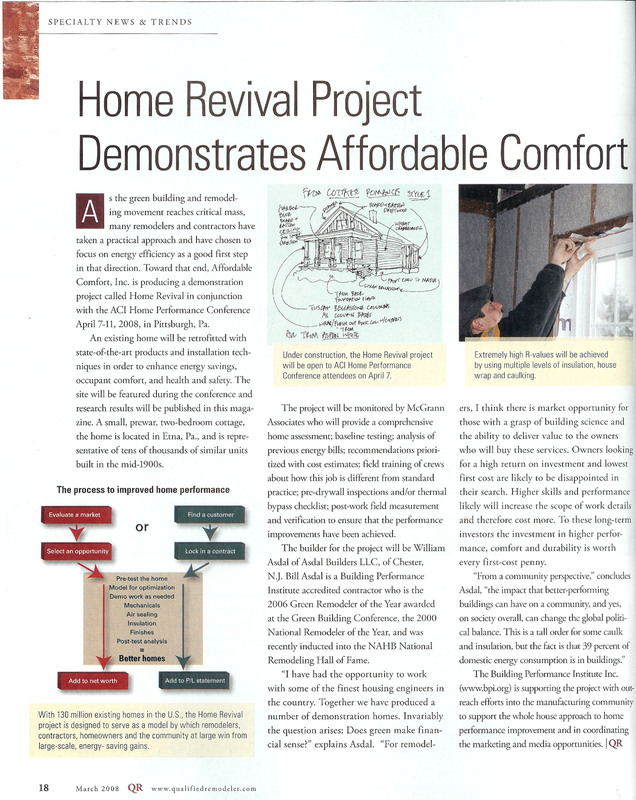 Affordable Comfort, Inc. is producing a demonstration project in conjunction with the ACI Home Performance Conference April 7-11, 2008. This existing home will be retrofitted with state-of-the-art products and installation techniques in order to enhance energy savings, occupant comfort, and health and safety. The site will be featured during the conference and thereafter through the consumer and trade media, as well as publication of the research results. It is located just ten minutes from downtown Pittsburgh and is representative of tens of thousands of similar units built in the mid 1900’s. The project will be monitored by MaGrann Associates who will provide a comprehensive home assessment, baseline testing, analysis of previous energy bills, recommendations prioritized with cost estimates, field training of crews about how this job is different from standard practice, pre-dry wall inspections and/or thermal by-pass check list, post-work field measurement and verification to ensure that the performance improvements have been achieved. The builder for the project will be William C. Asdal of Asdal Builders, llc, of Chester, N.J. Bill Asdal is a Building Performance Institute accredited contractor who is the 2006 Green Remodeler of the Year awarded at the Green Building Conference, the 2000 National Remodeler of the Year, and was recently inducted into the NAHB National Remodeling Hall of Fame. The Building Performance Institute, Inc. is supporting the project with outreach efforts into the manufacturing community to support the whole house approach to home performance improvement and in coordinating the marketing and media opportunities.